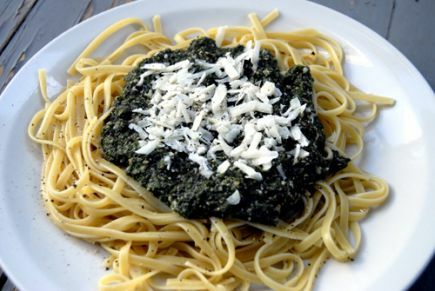 Stinging Nettle Pesto | GetOut! 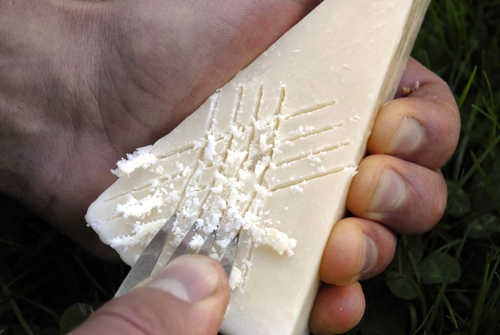 Tip: If you’re backpacking, you can still use a fresh chunk of parmesan cheese without packing a grater - grate it by scoring the parmesan with a fork (see photo). Or you can get this cool little mini grater. At home: Steam the nettles and then throw all ingredients in a blender and blend to a smooth consistency. Put in a water-tight container and take it with you to camp. At camp: Steam the nettles and then chop all ingredients as finely as you can. Put them in a bowl and mix. Pour pesto on top of pasta and grate parmesan cheese on top to garnish.